One of the hazards of breeding wild animals in captivity is that the forces of natural selection no longer act upon them. Specimens that thrive well enough of captivity are very often fundamentally quite different from those that would thrive in the wild. Those individuals who thrive well enough to reproduce may pass on traits that are entirely detrimental to living in the wild. If the goal is to produce domesticated animals, as was the case in Belyaev’s fox farm experiment, one should rigorously select animals for tameness, docility, and general ease of handling. Of course, when one does that, the animal fundamentally changes. We have been doing that for thousands of years. We have become experts at selectively breeding domestic animals for any number of traits. We do not care that our Yorkshire pigs are nothing like Eurasian wild boars. We do not care that our Herefords and Holsteins are nothing like the extinct wild Aurochsen. We are glad that our golden retrievers, Scottish deerhounds, and Pekingeses are not exactly like wild wolves. These domesticated animals fit their place in our society. They have a utility that is fundamentally different from their wild ancestors, and most of that utility comes from our skills at selecting desirable traits. However, when our goal is to produce captive populations of wild animals that can be reintroduced into the wild, we often have problems. Simply put, we cannot create the conditions in captivity that imitate natural selection. Try as we might, we simply cannot make it so that prey species evolve under predation. We cannot allow predators to hunt prey in captivity. If we are dealing with endangered animals, those activities are simply too risky to even try. Further, they most likely would violate animal cruelty laws and could even violate conservation statutes. Endangered and threatened species are also too valuable for their genomes to ever experience possible risks of damaging or killing them. They must be treated as carefully as any museum artifact. It is difficult to deny the reasoning behind such care. After all, every individual in a limited gene pool has importance, and we really shouldn’t be involved in what amount to canned hunts with endangered predators hunting endangered prey. As noted earlier, once animals are removed from the pressures of natural selection, the animals themselves can evolve to fit captivity. 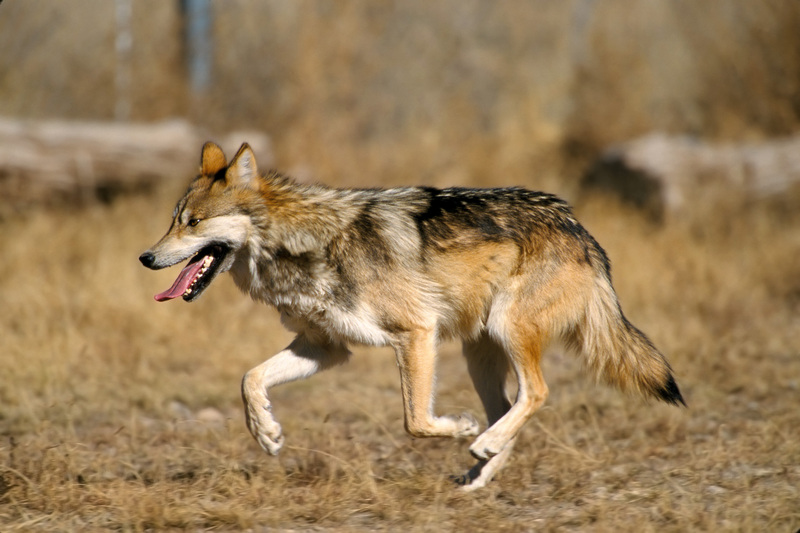 Take the case of one line of the endangered Mexican wolf. Mexican wolves (Canis lupus baileyi) are the smallest subspecies of wolf in North America. If the red wolf is a different species, it is generally believed to be the oldest extant subspecies in North America. It has unique markers in its mtDNA sequence that make it stand out from wolves from other populations on this continent. It was native to the Southwestern US and northern Mexico. It was extinct in the wild until 1998, when 11 individuals were released into the Blue Range in Arizona. Currently, about 50 Mexican wolves live wild in Arizona and adjacent New Mexico. However, as a subspecies, it does have issues with compromised genetic diversity. Mexican and US ranchers nearly wiped the subspecies out. The last of wild ones were all capture and then bred in captivity in hopes of preserving the subspecies. One particular line of Mexican wolf was the Ghost Ranch colony. It was captured in New Mexico, and one of the founders of the line looked a bit like a wolf-dog. However, the rest all resembled wild Mexican wolves. But as they bred over the generations, certain features began to pop up. Their heads got smaller. Their jaws got weaker. They were turning into dogs. This line was bred at Carlsbad Caverns, and when it was decided to start breeding Mexican wolves with the possibility of releasing them into the wild, the status of the Ghost Ranch wolves fell into contention. It is well-known that dogs and wolves will hybridize. In fact, it is probably not even correct to call wolf and dog crosses hybrids. They are now recognized to be part of the same species, Canis lupus. It was suggested that Ghost Ranch wolves were derived from hybrid stock. If that were true, then it meant that releasing wolves derived from that line could be contentious. The Endangered Species Act and state conservation laws were designed to protect Mexican wolves, not Mexican wolf and dog crosses. It would mean that a wolf haters could kill them and then claim that they were shooting a wolf hybrid, which is not a protected species at all. Of course, that is not a trivial concern. However, it was also suggested that the Ghost Ranch wolves were actually the result of a kind Belyaev experiment. Generations of being bred in captivity and being fed a less rigorous diet had changed these wolves in the same way the foxes were. Because of the potential problems, the Ghost Ranch wolves were euthanized. However, there are still a few individual wolves that are of the Ghost Ranch line. These animals are of great value. You see, a later study of the DNA of Mexican wolves, including those of the Ghost Ranch line, found that there was no evidence of hybridization with dogs or coyotes. Not only were they free of that “contamination,” they were clearly genetically distinct from any wolf population in North America. If only this sort of analysis had been performed before the majority of the Ghost Ranch wolves were euthanized, the Mexican wolf population would still have an important source of genetic diversity. Granted, they would probably would have those maladaptive doggish traits, but these possibly could have been bred out over time. Also, there were some concerns that the McBride line, which is the main line that was used for reintroduction purposes, might have some issues with an inbreeding depression, and while there was no evidence of an inbreeding depression, it is known that it does have compromised genetic diversity. The Ghost Ranch and Aragon lines are also somewhat inbred, but it would make sense that allowing blood from these previously believed “unpure” lines would end some of these possible concerns. However, there are very few Ghost Ranch wolves left. Twenty were found in the hands of a private owner, and these wolves were then added to the gene pool. But because of the unintentional domestication of the Ghost Ranch wolves, it was decided to get rid of this part of the gene pool. Of course, when one is already dealing with a very rare subspecies, breeding practices can be loosened. Texas cougars were released to augment the Florida panther’s genetic diversity. It is something that can be done, but it is generally frowned upon. Releasing a wild animal that has possible domestic ancestry would always be a legal cheval-de-frise that wolf haters could use, so maybe euthanasia was a good idea at the time. But all of this confusion could have been avoided if the wolves had been kept and bred to preserve as many wild characteristics as possible. This is not as easy as it sounds. Although we are experts at selecting for tameness and docility in domestic animals, we are not so good at selecting for the traits that make animals survive well in the wild. The best we can do is leave the animals alone in their enclosures and try not to put too many selective pressures for tameness on them. However, the result of doing such a thing means that one is potentially producing dangerous animals that zoo staff cannot handle. In the clip about the foxes, the “wild” group that had been bred to retain those characteristics was far more aggressive. The “dragon” fox would probably have traits that would be good to have in the wild. But those are just red foxes. What if we are talking about Amur (Siberian) tigers? Remember the San Francisco Zoo tiger that killed one person and maimed two others on Christmas Day in 2007? That tiger had traits that would have made her survive well in the wild. Her aggressive behavior was strong enough that she could escape an enclosure that easily held other tigers. Such an animal would be a liability in any facility, but her offspring might be well-adapted to eventually live in the wild. That is, if we ever figure out how to rewild captive tigers. So in the end, we are left with a balancing act. The animals must be bred so they retain at least some of their instincts and physical traits. However, they cannot experience natural selection as their wild ancestors did. They have to be treated with care. They also have to be able to be contained in an enclosure, and they have to be tractable enough to be safe for staff to handle. They also have to be able to breed in captivity, which is itself an important selective pressure. Not all individuals can reproduce in captivity. Male clouded leopards are often so aggressive that they kill their mates. To get clouded leopards to breed, males that are less aggressive toward their mates have to be used. That certainly will have an effect upon the behavior of their offspring. They may be less aggressive than typical wild male clouded leopards. All of these things must be balanced in the light of maintaining a dynamic and diverse gene pool. Breeding animals that could eventually live in the wild is a much harder undertaking than breeding domesticated animals. We must balance lots of things with domestic animals, but with these wild animals, we also have to think as if we are imitating natural selection. 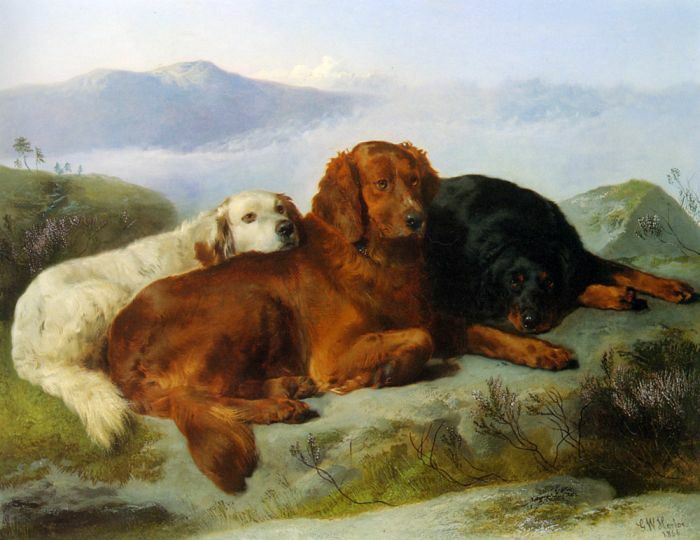 My assessment of this piece by George Horlor is the red dog and black and tan dog represent are most likely Gordon setters. The other dog is a prototype of what became the English setter. These dogs are more heavily-built setters than we typically imagine them today, even when we consider that Gordon setters are bigger and more heavily built than the other breeds. These dogs definitely had a role in the development of the retrievers. The red dog has some features we ‘d associate with modern golden retrievers . The skull is broader, and the build has some bone to it. Also note the lighter, almost golden shadings on the red dog. These features are very strongly associated with very dark golden retrievers. So when we think of setters from the eighteenth and nineteenth centuries, we should not automatically assume that all of them were like the dogs of today. Some of the dogs were indeed much more retriever-like than we might have previously assume. And the connections between setters and the “setter-retrievers” (goldens and flat-coats) become more obvious. In case you didn’t know, this clip is what that video is lampooning. All South American dogs are derived from North American ancestors. Although North America, Eurasia, and Africa have a certain level of diversity among their canine species, none matches South America for the diversity of wild dog species. At one time, North America surely once had a great diversity of these animals, but they were all eventually pushed south across the Isthmus of Panama into a brave new world in which there were no placental predators. The dogs found a niche and diversified into many unique forms to fill all sorts of unique niches. Maned wolves eat a lot of fruit. Indeed, there is a plant called the wolf apple that these animals find particularly tasty. Farley Mowat posited the controversial theory (and generally incorrect theory) that C. lupus lived largely on mice and small game. If only he had come across this animal. Here is a wild animal that has indeed suffered persecution because of its wolfish appearance, but its diet is made up of lots of fruit and small mammals. As strange as the maned wolf is, it is but one of many unusual species of wild dog in South America. My personal favorite is the web-footed short-eared dog, a creature about which we know very little. It eats a lot of fish (at least for a wild dog), and it swims well. And it looks like some sort of alien creature. It is extremely rare in the wild, and very few specimens have been observed in captivity. I like it because it is an enigma. We know it exists. We know it looks bizarre. There are still things to find out. As noted in an earlier post, the maned wolf is the closest relative of the warrah or Falkland Islands wolf, which is one of two members of the Order Carnivora to have gone extinct in historical times. The other is the sea mink of the New England and Maritime coasts. All other species in Carnivora that have gone extinct have done so in prehistory. Of course, they may not be the only ones. Tigers are very likely to be extinct in the wild soon. The exact timing of this event varies from source to source, often to give a certain amount of urgency to their plight. But tigers won’t go extinct. There are already more tigers in captivity in the United States than there are in all of Asia. When animals bred in captivity for generations, however, the Darwinian forces that have acted to form them no longer apply. In the end, wild predators become caricatures of their former selves, just as working dogs slowly lose their abilities after generations of being bred for appearance alone. Yes. I know this post was all over the place. Sometimes I need to do these.